To those who have seen a steady decline in employee productivity after hire – take an appraising look around you. Like what you see? The term Office, at one point, was arguably synonymous with uninspiring. Since then, companies world over have taken the hint and created environments conducive to interactivity, low stress and high energy levels. In case yours has yet to take the plunge, read on to learn the basics. The 9-5 culture sees people spend 8 hours in an essentially exposed, professional atmosphere with no place to let loose. As much as we are social animals, so too do we crave time apart– modern offices must provide for both. These functioning private zones, alongside an open-layout system, is the ideal blend. People can choose if and when they wish to work alone or collaborate. In case this is not a feasible option spatially, numerous companies have opted for smaller solutions such as mobile pods and wall partitions. They serve the same purpose, with fewer spatial constraints or construction expenditure. 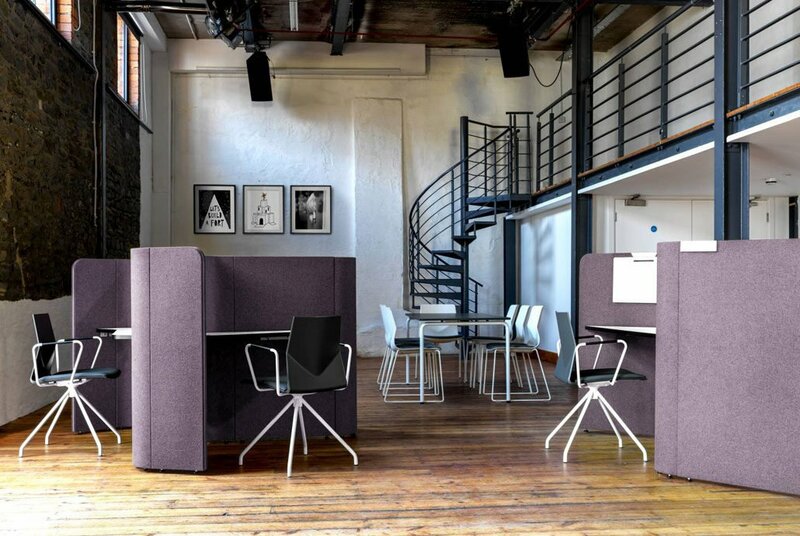 The innovative pod is a mobile piece that allows you to take your office with you anywhere you go. Compact, with the option to stand or sit within, one could move it around anytime they desire a change of scenery! Apart from this, wall panels or partitions allow for one to sit away from the crowd to get those crucial hours of alone time. Such zoning practices let your employees shift around as requirement dictates. Coming back to collaborative spaces, these are integral to innovation and problem solving. You enable brainstorming via open spaces, where people need not leave their desks every time they have a doubt or need help with something. Office desks such as the one pictured below, have lower partitions that separate two workstations, but with ample opportunity to discuss face to face. Google, from humble beginnings, is now an international giant heading multiple ventures (besides being the world’s largest search engine) – so they must be doing something right! We are inclined to believe that where a person works majorly impacts their output. 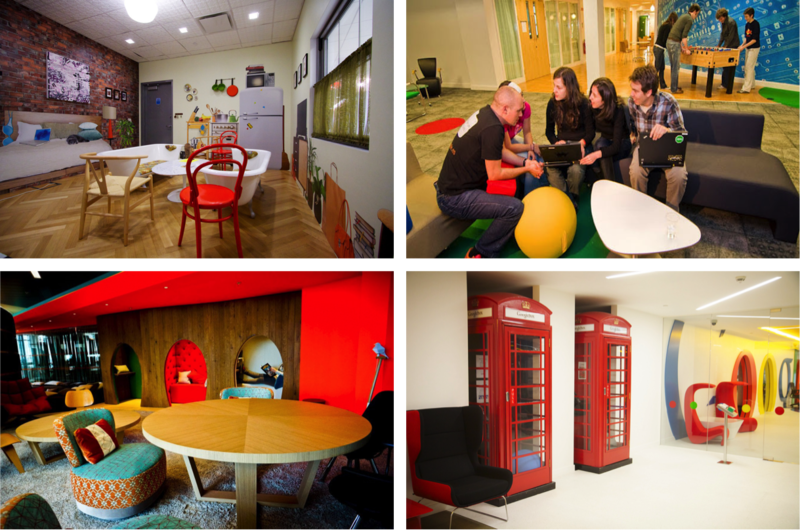 The zany int¬¬eriors of Google’s offices mimic various environments- some homely, others recreational, or something a little unpredictable like a biophillic space as pictured below! 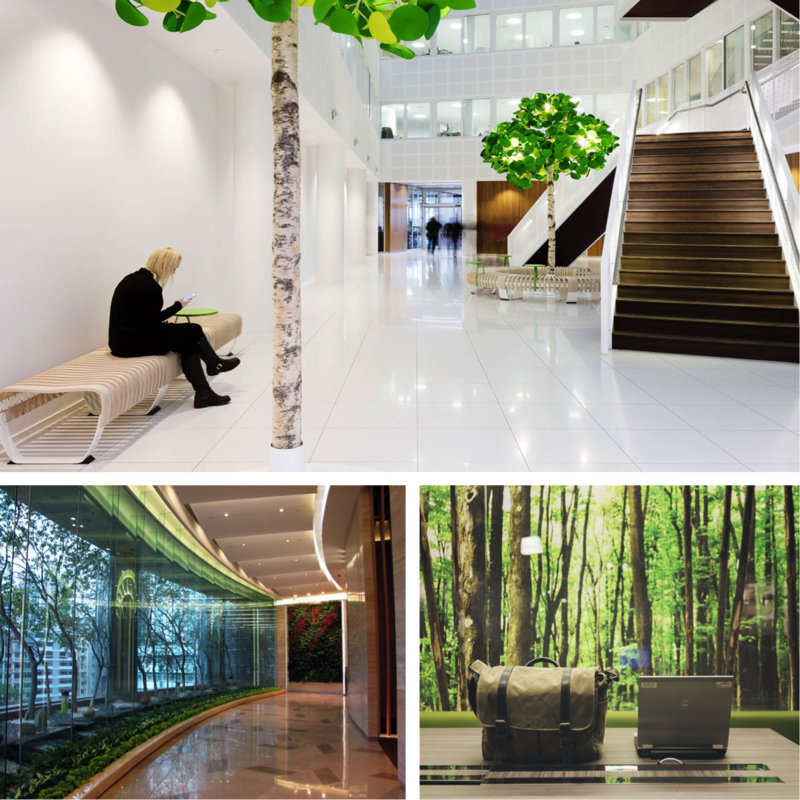 Biophilic spaces appear quite often and rightfully so! Integrating green plants and natural light (even natural themes in furnishings) can be seen to alleviate creativity and generate a positive state of mind. This is not really an interior trend, just an inherent part of human nature. The use of colour is next up on our agenda. Depending on your company culture and the kind of image you want to portray, you must decide what colours go with your brand. Many firms like to maintain logo colours, while some stick by standard white. Do not be afraid to experiment with different shades, as most now know, different colours stir up different emotions in people. A complementary mix of tones and textures is ideal. There are theories as to how the four basic colours effect ones being: Red-body, Blue-mind, Yellow-emotions and Green-balance. Pick your colours according to the kind of work your office conducts. For example to stimulate the mind at an accountant’s office, one might choose blue, at a fitness-training centre – red, for a graphic designer – yellow and for a yoga instructor – green. This is an overtly simplified example, but you get the idea! It definitely wouldn’t hurt to do a bit of research on colour theory and psychology. Another point to note – a higher saturation is always more stimulating than pastels. The more intense, the stronger one reacts to the colour. Muted tones of grey, pink or blue, though calming, might not benefit an office space where energy and productivity is key. Design talk aside, if you’re looking to create a new office or redo your old one, why not try asking your employees! For those who spend most of their waking hours here, adding a personal touch will ensure that they are more at home. This is a sure-fire method to generate employee motivation and increase productivity levels. By forgoing conventional office interiors, you draw in rather than repel your employees. Maybe even get them excited to come to work. No need to look so sceptical! A whole lot has been, and can be accomplished with the power of design. This entry was posted in Inspiration and tagged Office Furniture, Office Ideas, Office Space.